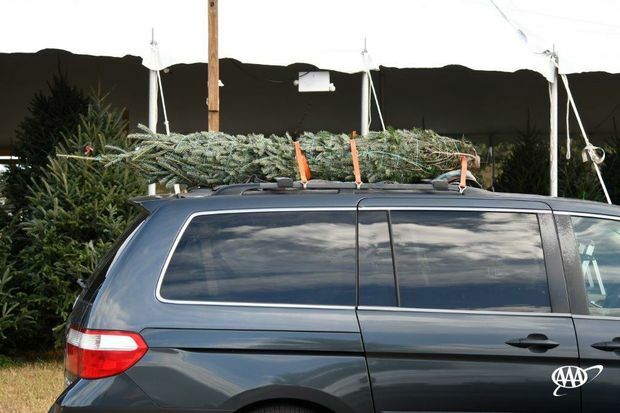 According to a new AAA survey, an estimated 20 million Americans who purchased a real holiday tree in the last three years did not properly secure it to their vehicle, risking serious vehicle damage, dangerous road debris, and hefty fines. With that, AAA East Central and PennDOT are urging all drivers to transport their holiday trees safely this holiday season. Drivers can face hefty fines and penalties as well as jail time if an unsecured tree falls off their vehicle. According to PennDOT, Pennsylvania drivers can face a range of fines for items that fall from their vehicle on the road. Prepare before you head out. Make sure before you leave to purchase your tree, you have rope or ratchet straps, an old blanket, gloves, and the right vehicle. A vehicle with a roof rack is best, but a pickup truck, SUV, van or minivan are also suitable. Protect the tree. Have the tree wrapped in netting before loading it. If netting is unavailable, secure loose branches with rope or twine. Consider using a sturdy tarp to cover the tree. Give it the tug test. Before you leave the lot, give the tree several strong tugs from various directions to make sure it is secured in place and will not blow away. Also, give the tree a visual inspection, looking for any chance of debris or cargo falling or blowing out.